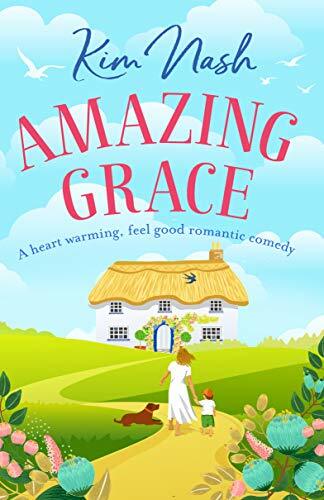 It’s a pleasure to review Kim Nash’s debut novel Amazing Grace today. I have known Kim (in the virtual world) almost since I started blogging when I read and reviewed books from publishers Bookouture, where she is PR & social media manager. She also blogs as Kim the Bookworm and now she has written her own novel! You can see from the number of bloggers who have jumped at the chance to take part in the tour just how respected Kim is. Amazing Grace tells the story of single mum Grace. She works hard at an estate agents and absolutely adores her son Archie and their dog Becks – named after David Beckham of course! Life has been hard at times for her with losing her beloved mum to cancer and her marriage splitting up due her her husband Mark’s infidelity. There is something in Grace which I think every woman will identify with. Whether it’s being a working mum, a single parent, or looking after her boy and the dog and cleaning the constant mess that seems to follow them, or lacking in self confidence about looks and ability, I think there’s a little bit of Grace in all of us. We all need a Monica and a Ruth in our lives. Friends who support and empower us are so important. We don’t need a Mark! He was such an unpleasant character, so self centred and always putting Grace down. And we all need a Vinnie, someone who will love and cherish us for what we are, someone who puts us at the centre and will encourage us that we can do whatever we set our hearts and minds on. Amazing Grace is a heart-warming and uplifting story. You will be cheering Grace on as gradually she begins to believe in herself again, and to stand-up for herself. And although I didn’t know the author’s mum of course but I’m sure she would be as proud of Kim as we can see Grace’s mum is of her in this book. My thanks to Rachel at Rachel’s Random Resources for my review copy of the book and inviting me to take part in the tour. Amazing Grace is published by Hera Books and available to buy now. Buying links are below and at the time of writing it is available to buy for a mere 99p!